Who on earth can stop Bianca Andreescu right now? The Canadian ace is the talk of the tournament at the BNP Paribas Open after yet another victory – this time over China’s Wang Qiang 7-5, 6-2. Now into the quarter-finals at Indian Wells, the 18-year-old has every opportunity of going even deeper at the first Premier Mandatory event of the season. It didn’t take long for Andreescu, the youngest player left in the tournament, to set the tone for the match as she applied heavy pressure on her opponent right from the off. Despite pulling back to 30:40, Wang dropped her serve in the very first game to hand the Canadian an early advantage. Having beaten Switzerland’s Stefanie Voegele 6-1, 6-2 in the previous round, it looked as if Andreescu was about to put on another dominant display as she stormed to a 3-1 lead. Wang, seeded 18th, is made of sterner stuff than Voegele, though, and ensured the set wasn’t a walk in the park for the Mississauga-native, battling back to break her serve in the eighth game. Andreescu, showing the sort of determination that has seen her rise to No. 60 in the WTA rankings since the turn of the year, retook control with a break of her own to make it 6-5, setting up a chance to serve for the first set. The 18-year-old didn’t disappoint, dispatching the game to claim it 7-5. The second set was slightly more straight forward for Andreescu. Again, she broke Wang’s serve in the very first game, but this time she didn’t allow the 27-year-old a way back. Even when the Canadian face three break points in the sixth game, she stood up to the challenge and fought back valiantly to see them off unscathed. When Wang then dropped her serve for the third time the very next game, the match was all but won. All Andreescu had to do was hold her own serve and a quarter-final place was hers. She did so, despite having to face another break point, to take the set 6-2 and claim the biggest win of her career to date, guaranteeing her a place in the top 50. Welcome to the Top 5️⃣0️⃣, Bianca Andreescu! 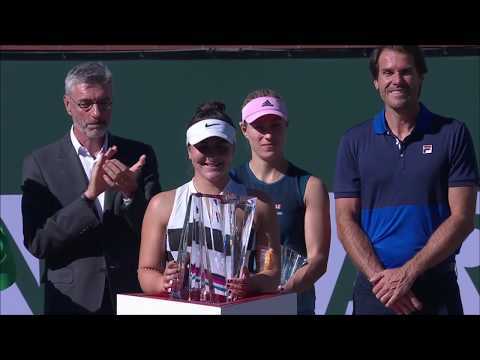 @Bandreescu_ defeats Wang Qiang 7-5, 6-2 to reach the quarter-finals of the #BNPPO19, her biggest result to date — one that guarantees a major ranking milestone.